From the earliest masonic documents currently known to us, we can form a decent picture of the workings of a lodge of operative stone masons around the late 1300s.1 In this paper I will briefly try to give an overview of the workings of an early lodge, as well as touch on some masonic myths and legends of our early brethren. The Manuscript Constitutions opened with a prayer, followed by an introduction to the night’s proceedings. This included a mention of the importance and antiquity of the craft, a mention of the charge which would later be read, and a recommendation that all present heed it well. "Good Breetheren and Fellowes: Our purpose is to tell you how and in what manner this worthy science of Masonrye was begunne, and afterwards how it was favoured by worthy Kings and Princes, and by many other worshipfull men. And also, to those that be willinge, wee will declare the Charge that belongeth to any true Mason to keepe for in good faith. And yee, have good heede thereto; it is well worthy to be well kept for a worthy craft and a curious science. That last sentence serves as a segue into the next section which explains the seven liberal arts and sciences. There is an assertion that all of the liberal sciences are dependant to some extent on geometry, and that masonry is geometry. Before Noah’s flood there was a man call Lamech. Lamech had two wives; Adah and Zilla. By Adah, he had two sons; Jabal and Jubal. By Zilla he had a son named Tubal Cain and a daughter named Naamah. These four children founded the beginning of all sciences in the world. The eldest son Jabal pioneered the science of Geometry, and he “departed flocks of sheepe and lambs in the field, and first wrought house of stone and tree.”6 His Brother Jubal gets the credit for inventing music. Tubal Cain was the first artificer in metals, and his sister Naamah the craft of weaving. These children apparently knew that God would take vengeance for sin, either by fire or by water. They set about recording their sciences in two pillars, one of brick to survive fire, and one of marble to survive the flood. Sure enough the pillar of marble did survive the flood, and was apparently discovered by none other than Hermes Trismegistus. Hermes learnt the foundation of all knowledge from the marble pillar, developed that knowledge, and spread it amongst mankind. From there we are left to assume that the knowledge of Hermes made its way to Babylon. Apparently Nimrod, the king of Babylon formed the first masonic lodge. He brought masons together, had them elect a master from amongst themselves, submit to a set of charges, and swear an obligation, before sending them off to work in another city. "At the making of the Tower of Babylon, there was Masonry first made much of. And the King of Babylon that was Nimrod was a mason himself, and loved well the science as it is said with masters of histories. And when the City of Nineveh and other cities of the East should be made, Nimrod the King of Babylon sent hither three score masons at the rogation of the King of Nineveh, his cousin. And when he sent them forth he gave them a charge in this manner. And this was the first time that ever Masons had any charge of his science. The first was that they should be true to their King, Lord or Master that they served and that they should Ordain the most wise and cunning man to be Master of the King or Lords work that was amongst them, and neither for Love, Riches nor favour to set another that had little cunning to be Master of that Work whereby the Lord should be ill served And the Science ill Defamed. A few versions of the Manuscript Constitutions mention details of the legend of the tower of Babylon. In it the Babylonians sought to build a tower ridiculously high to show off their knowledge of architecture and masonry. This blatant lack of humility enraged God to the point of confounding their language. The interruption of the work brought about by the confusion of tongues, caused the dispersion of the builders. The workers spread out to foreign lands, taking their knowledge of masonry with them. Abraham had attained a wealth of masonic knowledge, and was an expert in the seven liberal arts and sciences. He travelled to Egypt with his pupil, Euclid, who likewise became a master of such knowledge. At this time in Egypt, the lords or rich men had a vast amount of sons. Unemployment became a big issue for them, and a plea went out offering a reward for anyone who could put these young men to work. Euclid laid a proposition on the table. So long as he was to be in charge and could do things his way, he promised to teach these men geometry and show them how to build temples and castles. The lords approved, and Euclid made good on his promise. He gathered the young men together, taught them geometry and building techniques, charged them with the laws and regulations of the craft, and put them to work. In doing so, Euclid spread the science of geometry and the craft of masonry throughout Egypt. From Egypt the craft spread to Jerusalem. King David, like Euclid and Nimrod before him, employed and instructed masons, and charged them with the regulations of the craft. David’s son Solomon followed in his father’s masonic tradition. 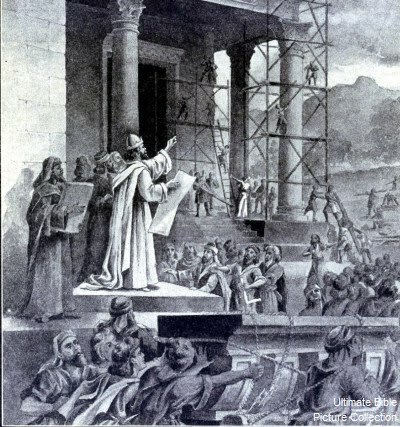 When Solomon got to work on his temple, he employed thousands of masons from many lands. Some of the Manuscript Constitutions go into great detail about how many masons were set to work on which task, and in what manner whilst building the temple. Others skip through this part of the Traditional History quite briefly. Either way, our current tradition borrows quite heavily from this small section of the legend. The Traditional History makes a bit of a leap forward in time, mentioning that a Greek artisan, who had descended from Greek masons working in Jerusalem, ended up in France. This unknown Greek mason is given the pseudonym “Namus Grecus”. He educated the men of France in the craft, and caught the attention of Charles Martel. Martel was of royal lineage and loved the sciences. He became a keen student of Namus Grecus, and when eventually he ascended the throne of France, he became a patron of the craft. In this manner Byzantine architecture made its way from Greece to France, and the masonic tradition continued with royal patronage. Later, we hear that masonry travelled to England and was governed by St Alban. According to the masonic legend, St. Alban was the steward of the household of Carausius. Carausius was the Roman naval commander who had revolted from the Emperor Maximilian, and declared himself emperor over Britain and northern Gaul. He employed St Alban to build the town walls. Upon receiving the superintendence of the Craft, St. Alban responded in a similar manner to his predecessors. He treated masons with great kindness, increased their pay, and gave them a charter to hold a general assembly. He assisted them in making Masons, and framed a constitution for them. Soon after the death of St Alban, England was at war. The result of this was that masonry was stamped out in England until the time of King Athelstane. According to the legend, King Athelstane also loved masonry, and caused many buildings to be erected during his reign. His son Edwin apparently loved the craft even more and became heavily involved with the institution itself. Edwin collected different versions of the history, science, and charges of the craft from many different nations and cultures, and compiled them into one document. In the year 926, Edwin called together a General Assembly of masons at York. There he shared his knowledge of the craft, read its history, and submitted all present to the charges he had collected. He also declared that from that day forth, at the making of a mason this work must be read. It is implied in the Manuscript Constitutions that the Traditional History that had just been read was a copy of the document put together by Edwin in 926. Likewise, the charges that were to follow the retelling of the Traditional History were implied to be those laid down by Edwin. Be true to Church and King. Be true to each other and follow the golden rule. Treat each other in a respectful and honourable way, and generally behave yourself. Do not mistreat or make advances on your brethren’s wives or daughters. Do not take on a job that you are not qualified or able to do. Do not take on so much work that the quality of your work might suffer, or that deadlines might not be met. Treat employees fairly and pay them well. Take no apprentice unless you have enough work for him, and he can serve a term of seven years. Do not get involved with unlawful or dishonourable activities like gambling. Do not bring disrespect upon the craft. The charges our operative brethren submitted to were issued as a practical matter for the good of the construction industry at the time. Still, there are morals we can take from them in a purely speculative context, and apply them to our own lives. The Traditional History has often been scoffed at and ignored by many masonic students and researchers, merely because it is factually incorrect. The anachronistic sequence of events and confusion of names and locations have seen it deemed, quite unfairly, as a complete waste of time. To the contrary it is invaluable. Here we have our own mythology; our own romantic rendering of how things came to be. Even if only for the quaint nature of the account, and the sort of character it presents of the craft as a whole, it is worth reading. For the more inquisitive brother there are two other avenues to explore with our Traditional History. You could become more familiar with each of the characters mentioned in the story, and gain a better insight of the nature of the craft as our ancient brethren tried to depict it. There are enough people and events mentioned in the story, each with their own back story, to keep you reading for a long time. For the even more inquisitive brother, you could explore the scriptural and historical discrepancies in the story. Discovering the texts that our ancient brethren misunderstood and misquoted from, and unpicking the resulting “Chinese whispers” can present quite a bit of detective work. The end result of such enquiry would be a wealth of historical knowledge, scriptural familiarity, as well as being introduced to some historically significant, but often unheard of literature. The records of the Masons Company of London going back to 1356, and the Halliwell MS dated to around 1390, it would be fair to say that some form of ceremony involving the reading of the Old Charges was in use around that time. H. Carr, "600 Years of Craft ritual" AQC Vol. 81 (1968) p.157. W.J. Hughan, "The Old Charges of British Freemasons" (1872) p. 25. Dowland's MS.
A.G. Mackey, "The History of Freemasonry" vol. 1 (1905) pp. 111-115. W.J. Hughan, op. cit., p.26. Dowland's MS. This account of the Babylonian portion of the Traditional History is my own rendering of it. It was taken mostly from the Landsdowne MS, with details filled in from other versions of the MS Constitutions as found in W.J. Hughan's "The Old Charges of British Freemasons". The spelling has also been corrected. My intent was to relate the Babylonian legend of the Old Charges in the style in which they were originally written, without going into explanations of how different versions vary and why. H. Carr, op. cit., p.155. Where Carr has translated the word "senioribus" as "elders", in the context given I believe it refers to a senior member, and have applied a little creative licence rendering it "senior brethren". The original Latin: "Tunc unus ex senioribus tenent librum, et ille vel illi opponunt manut sub libri, et tunc precepta deberent legi." W.J. Hughan, op. cit., p.39. York MS. No 1.